In business as in sports, building and playing on a dream team is how legends are made. This book has just made it easier to create and sustain the kind of winning team that competitive business demands. Build your own dream team! In this much-anticipated follow-up to the best-seller TURNING TEAM PERFORMANCE INSIDE OUT, training professionals Susan Nash and Courtney Bolin deliver the tools you need to create and sustain a winning team. Here you will find more than 60 charts, exercises, assessments, and case studies--unique in methods for linking team members' personality attributes to group effectiveness--illustrating how to implement the approaches and ideas introduced in Nash's classic. This companion fieldbook also charts the course for using the original book's powerful SCORE model to improve team performance. 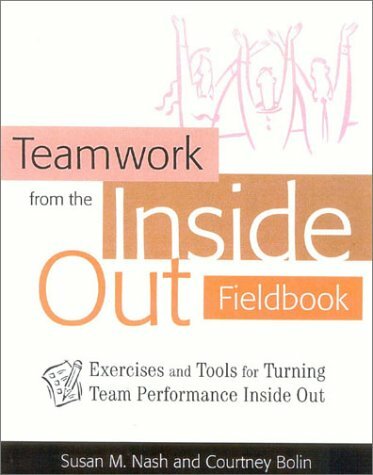 For anyone trying to build a cohesive team while celebrating diversity, TEAMWORK FROM THE INSIDE OUT FIELDBOOK offers instruction and coaching tips for recognizing the gifts and challenges each player brings to the game, diagnosing problems, capitalizing on individual and team strengths, reducing stress, and improving team productivity. Susan Nash, in her 20-year career as an organization development and training professional, has worked with more than 10,000 individuals in 50 organizations throughout the U.S. and Europe. Founder and owner of EM-Power, a million-dollar consulting firm serving such clients as Oracle, KPMG, Seagate, and Charles Schwab, she is the author of six books, including TURNING TEAM PERFORMANCE INSIDE OUT. She was formerly director of training at Williams-Sonoma. Courtney Bolin is principal of Behind the Bottom Line, an organization development and training consulting firm whose clients include US West, Cisco Systems, PETCO Animal Supplies, and Cost Plus. A certified MBTI (r) practitioner, Bolin previously worked with Andersen Consulting as a Change Management Consultant.